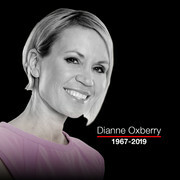 Sad news today, as it was announced that BBC North West Tonight weather presenter - Dianne Oxberry, has passed away aged just 51. She died at Manchester’s Christie’s Hospital after a short illness. Dianne leaves behind a husband and two young children. Dianne was a colossal. Not only did she work on BBC Radio 1 & 2, before joining BBC North West Tonight in the mid 90’s, but people of a certain age may remember her presenting the kids Saturday morning TV show - The 8:15 From Manchester. It really is awful news. I’m sure I speak for everyone at UK Weather Watch in offering our deepest and sincerest condolences to Dianne’s Family and Friends.